In 1944, the Fylde Historical Society, then nearly ten years old, republished Hutton's description of Blackpool in 1788, our earliest glimpse of the infant resort. 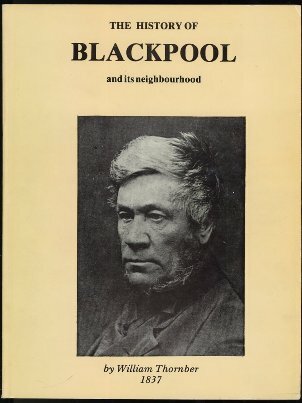 Now the same society, having just celebrated its jubilee, is making available William Thornber,s pioneering history of Blackpool and the surrounding area, to commemorate the centenary of his death. The book was first published in 1837 and reprinted in 1840, 1842 and 1844. This edition employs facsimiles of the pages of the original, but the lists of plants, birds and crustaceans (pages 143 to 149, 186 to 188 and 251 to 266) have been omitted. However, personal name and place name indices, compiled by Norman Cunliffe, have been added. Thornber, himself, was a significant and fascinating figure in Blackpool,s history. His text is preceded by a poignant biography of him by Alan Stott.